President Obama told Oklahomans they would "have all the resources they need" as they begin recovery efforts from a series of tornadoes that claimed the lives of several dozen people. Obama declared a disaster in the state, freeing up federal funding and resources to assist those affected. Assistance can include grants for temporary housing and home repairs, low-cost loans to cover uninsured property losses and other program to help recovery efforts, according to the Federal Emergency Management Agency. 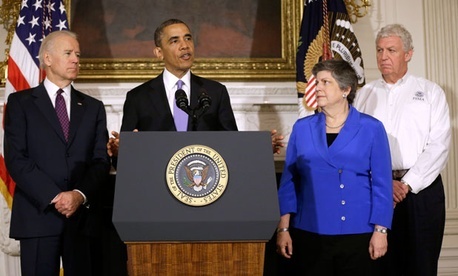 “I spoke with [Oklahoma] Governor [Mary] Fallin to make it clear that Oklahomans would have all the resources they need at their disposal,” Obama said in an address Tuesday morning, where he was joined by Homeland Security Department Secretary Janet Napolitano. The DHS head planned to visit the disaster area Wednesday, according to the White House. Fallin later told reporters she spoke with Obama again and he reiterated FEMA would be there to help and bring any needed resources. She added other Cabinet secretaries had called to give prayer and offer assistance. “To the federal leaders here, we appreciate you,” Fallin said. Craig Fugate, FEMA administrator, arrived in Oklahoma Tuesday to assist in recovery efforts. Fugate named Sandy Coachman as the federal coordinating officer for federal recovery operations, but said at a press conference the agency’s primary role is that of support, while lead efforts were headed by state and local groups. FEMA has activated the National Response Coordination Center in Washington, D.C., a multi-agency group that helps oversee the federal response to natural disasters and emergencies. The agency also deployed an Incident Management Assistance Team, Urban Search and Rescue Teams and a Mobile Emergency Response Support Team to Oklahoma to help coordinate operations and provide logistics support. The Small Business Administration has begun preliminary damage assessments to help identify the damages. The Oklahoma National Guard has deployed nearly 250 members to assist in victim search and security. FEMA has also felt the strain of sequestration, slashing $1 billion from its fiscal 2013 budget thanks to the automatic cuts, according to The Washington Post. White House Press Secretary Jay Carney said Tuesday that for now, FEMA has enough cash on hand to deal with the disaster. Carney would not directly address concerns raised by lawmakers about the need to offset any extra FEMA appropriations, but said in the past Congress has allowed the administration to do what was required. Sen. Barbara Mikulski, D-Md., chairwoman of the Senate Appropriations Committee, said the federal government should do whatever it takes to help those in need.